Old Bollywood movie poster of the cult classic V. Shantaram Hindi film, Do Aankhen Barah Haath (1957) for sale. This is an actual surviving original vintage Bollywood poster of the 1957 hit Hindi film that starred V. Shantaram and Sandhya in lead roles. Produced and directed by one of the most influential filmmakers in Indian cinema, V. Shantaram, Do Aankhen Barah Haath is considered as a must see film in Indian cinema. 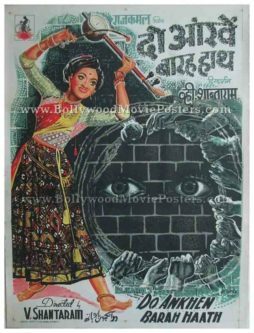 Do Aankhen Barah Haath won the Silver Bear at the Berlin Film Festival and the Samuel Goldwyn award for best foreign film at the 1959 Golden Globes, making this very rare hand painted Bollywood poster, highly collectible! A song from the film, “Aye Maalik Tere Bande Hum” sung by the Nightingale of India, Lata Mangeshkar is regarded as one of the most memorable songs in the history of Indian cinema. Printed and circulated during the original first release of the film (late 1950s), this old hand painted Bollywood poster was originally designed for publicity of the film but never ended up being used. This beautifully designed Bollywood movie poster was originally hand painted on canvas by one of the greatest Bollywood poster painters of his time, G. Kamble from Kolhapur. G. Kamble shot to fame by winning the publicity contract for the most expensive movie ever made in Indian cinema, Mughal-e-Azam. The printed signature of master Bollywood poster painter G. Kamble is seen on the bottom right of this old Bollywood poster. The design mimics the theme of the film – A jailor who is out to reform six convicts. G. Kamble chooses an abstract method to capture the jailor with a pair of watchful eyes peering through a brick wall. The six convicts are depicted through twelve hands working in unison. A beautiful hand painted portrait of actress Sandhya playing a musical instrument on the top of her head is seen on the left.